The Miranda is a ranch-style home that will proffer generous living space to its residents. This house occupies a total of 5,308 square feet, with the enclosed interiors measuring 3,490 square feet. Upstairs, the master’s bedroom is built with its own sitting area, master bath with tub, and walk-in closet. The 3 bedrooms adjoining it are also interspersed with another bathroom and a laundry room, as well as access to a loft. Downstairs, the Miranda features an integrated living and dining room, an island kitchen with a nook and built-in family dining area, a shared bathroom, a covered porch, and a three-car garage with ample parking for a recreational vehicle (RV). It will be a joy for us to build the Miranda with you. Perry Homes Utah has gathered 40 years of experience in the home building industry, but we’ll never grow tired of delivering top-tier but affordable construction to our customers. We’re known not only for the quality of our work but also for emphasis on customer communication. Each client will be paired with a design specialist to help them make informed decisions about the home construction. As such, the home construction should prove to be an easy, organized, and memorable experience to our company’s customers. 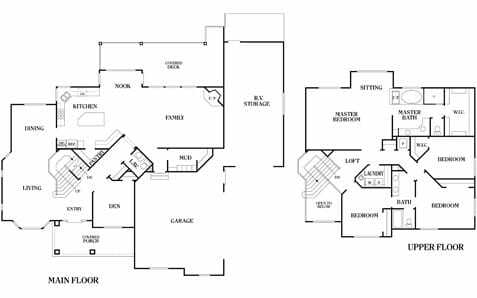 Call Perry Homes at 801-264-8800 to learn more about the Miranda’s house plan. Alternatively, you can visit our Contact Us page and fill out the form, and we will respond to you in a timely manner. Build the home of your dreams with us today!